After yet another long absence, here are some more reviews (some more timely than others!). Mainly I'm interested in bigging up Joe Wright's latest, but I'll also briefly mention a couple of others from the last few weeks that I never found time to write about. 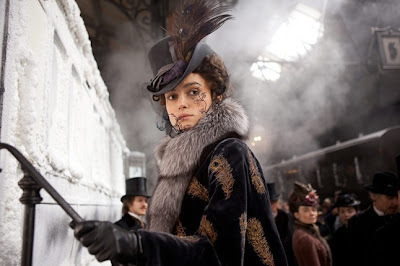 Having leapt out of his period drama comfort zone with the bold and unconventional 'Hanna', Joe Wright has returned to more familiar ground with this adaptation of lauded nineteenth century novel Anna Karenina, also renewing his partnership with Keira Knightley - star of 'Pride & Prejudice' and 'Atonement'. Yet his treatment of Tolstoy's Russian Lit classic is more reminiscent of his under-appreciated 2011 action-thriller than might have been expected, retaining much of that film's dynamism and editing panache. As with 'Hanna', and 2009's patchy misfire 'The Soloist', sound and image are inseparable here, with the line between diegetic sound and Dario Marianelli's score hard to determine. Wright's bravura camera-work - at times a little self-conscious, but always technically impressive - is now indelibly linked to the soundtrack in a way only matched in contemporary movies by Paul Thomas Anderson. Because Wright continues to develop this approach, 'Anna Karenina' feels like the evolution of his style rather than a retreat back to the comfort zone. In fact, if anything, the way Wright has chosen to stage this adaptation feels more experimental and imaginative than anything he's attempted previously. The whole thing is presented as though it's occurring within one old theatre, with the sets changing around the actors. Yet the film never feels stage-bound or overly theatrical, with this conceit instead increasing the sense that this tragic love story is larger than life. This stylistic choice (which could sound irksome on paper) never seems in the least contrived or heavy-handed either, carried off with a disarming lightness of touch. It's consistently implemented, yet it never upstages the story or characters. Of course, at just over two hours in length, this is an abridged version of the story, told in broad brush-strokes, yet that is also to its great credit. This isn't an overly literal adaptation, committed to bringing the book's events to the screen in as much detail as possible, but rather Tom Stoppard's deft screenplay boils the thing down to its essential elements and Wright uses the tools of his trade to incite the viewer to feel Anna's all-consuming passion for Aaron Taylor-Johnson's dashing Count Vronsky - and all the feverish madness that it brings. It's a visceral and emotional telling of the story, rather than an intellectual one, but it works extremely well. Arguably Tolstoy's command of realism and his political/spiritual consciousness is a casualty of this treatment (though neither is wholly absent), but this version gets everything else right. It certainly works as a character study, supported by a fine central performance from an actor in form, with Knightley impressing recently in films are varied as 'Never Let Me Go' and 'Seeking A Friend for the End of the World'. It also benefits from an eye-catching supporting turn from Jude Law as Anna's jilted husband, confirming once and for all his chops as an interesting character actor when not asked to be a leading man (for another example of this phenomenon, see: Colin Farrell). And, though I don't usually mention costumes, hair and make-up (things I generally have little interest in and next to no understanding of), the work here is uniformly brilliant, with a range of interesting hairstyles and moustaches to suit every finely tailored cavalry officer's uniform. I can't vouch for whether or not real Russian aristocrats of the era looked like they'd stepped off the cover of Sgt. Pepper's, but these guys look fantastic. 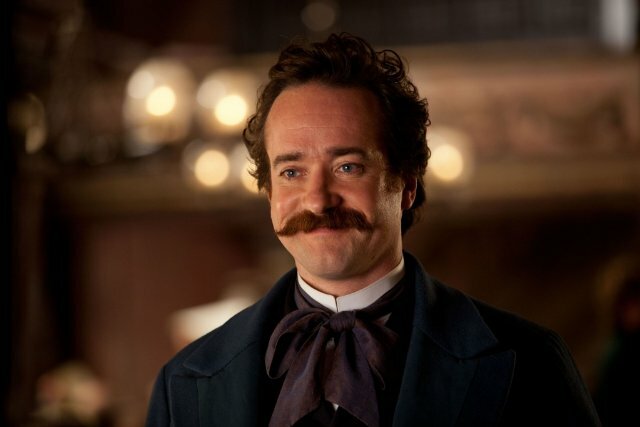 Special mention goes to Matthew Macfadyen's extraordinary and enviable facial hair (below). Spinning out of the decidedly un-Tolstoyan literary world of ubiquitous Norwegian scribe Jo Nesbø, whose work inspired the bewildering WTF-fest that was 'Headhunters', comes 'Jackpot': another Scandinavian crime thriller of indeterminable earnestness. This strange Christmas movie (released in the UK at the height of summer), sees a collective football bet - between some leather jacketed nutters who work in a Christmas tree factory and their meek friend - end in betrayal and bloody violence, with the now customary mix of ultra-violence, bizarre comic interludes, lost in translation regional humour and gritty social realism. As with 'Headhunters' earlier this year, I enjoyed it without really understanding a) whether I was watching it properly, b) what was going on at all on a plot level and c) whether it was supposed to be hilariously funny. I don't know whether either film is objectively "good", but both are utterly insane and highly watchable. Both made me cry from laughing and neither go where you would expect them too. What's more, the characters are, to a man, morally bankrupt and generally quite foolish - with the most appealing in this case being Henrik Mestad's sarcastic and world-weary detective. All in all, a good time at the pictures. An interesting curiosity that leaves much to be unpacked and pondered upon, Peter Strickland's second feature - following his roundly-praised low budget Romanian debut 'Katalin Varga' in 2009 - is a psychological thriller of sorts. In it Toby Jones plays a nebbish sound technician from the UK, whisked to Rome in order to create sound effects for a Dario Argento style horror movie. The tone and look of this 70s-set piece is pitch perfect, with a lot of fodder for cinephiles in the details. Jones, so often a scene-stealing supporting player in bigger budget movies, excels in the central role. The story, however, is incredibly slight and the whole thing is aimed at the intellect rather than the heart. That isn't a criticism exactly, but it perhaps explains why I have difficulty getting excited about it beyond appreciating the excellence of its constituent parts. Highly polished and completely unique, but more to admire than love here.